This morning, I needed to run some errands and recorded a couple more videos for the Polar Bear Challenge. After today's upload (2016 PBC #4), I still have four more in the queue. If I'm going to try and upload one every day, I think I'll need about 15 or 16 in reserve. One of the errands was to pick up some pearl barley to make Trobairiz' "beef" barley soup. I'm enjoying a delicious bowl right now while doing this post. 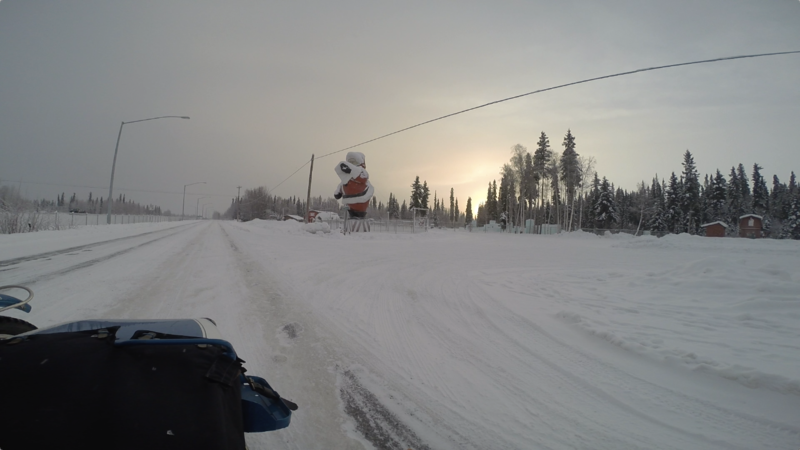 This picture was taken next to the east ramp of the Fairbanks International Airport. There used to be all sorts of information displays here the last time I was out here. Not sure why they would take them down. This is a frame from the GoPro. I'm on the Richardson Highway just getting ready to turn off at Badger Road. The sun is about an hour after sunrise. At this time of the year, this is about as high as it gets. The temperature is around -4°F at this point and it feels like my left Gerbing G3 glove is not working again. What a pain. I turned around at the Santa Clause House. One of the really touristy things around here. Here is the Santa version of a "muffler man". Note the barb wire fence around the figure. Below is the 4th PBC video but is not the one that I recorded today. Glad I could give you an excuse to get out, not that you need one. Thanks for the shout out too. Your weather is looking pretty chilly. 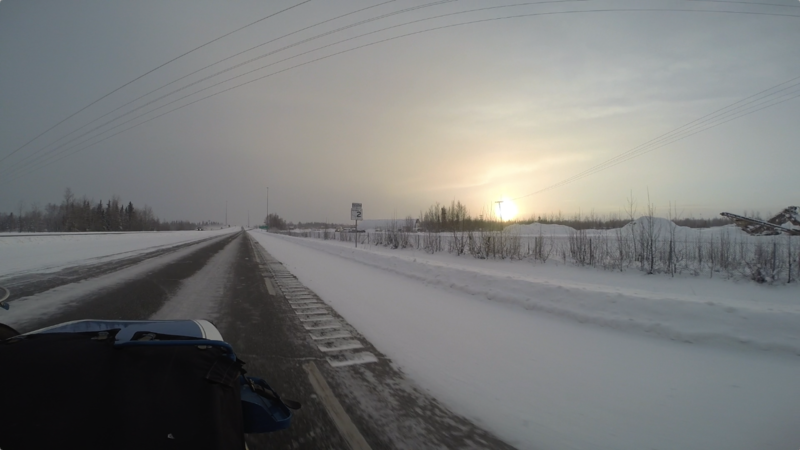 Great stills from the GoPro. Really, I don't need a reason (or excuse) to get out and about? The soup turned out great, thank you! The Muffler Santa! Now that's a great roadside attraction given the time of the year. Always good to see you play outside. Almost always up for a ride. Even if it's short. So exactly which is the weak spot in your gloves? The wires, cables themselves? Do they plug into the ends of sleeves like my Widder's do? The weak spots in the gloves are the connectors and where the internal wiring connects to the wire leading from the connector. There is a strain relief but they break right after it. The same with the connectors. The wire breaks just beyond the strain relief. And, yes, they plug into the connectors coming out of the sleeves of the liner. The other fail point are the connectors where it comes out of the jacket liner and plugs into the cables from the controller. Thank you! That was taken in the fall from the top of Murphy Dome. The first time I've ever been up there in all of the years that I've lived in Fairbanks.